Transit Signal Priority (TSP) tools modify traffic signal timing or phasing when transit vehicles are present either conditionally for late runs or unconditionally for all arriving transit. TSP can be a powerful tool to improve both reliability and travel time, especially on corridor streets with long signal cycles and distances between signals. In urban contexts, TSP benefits are significantly amplified when implemented alongside other strategies like dedicated transit lanes. The most common tools are detailed on the facing page. Where signals are a major source of delay for transit, particularly when signal delay is a significant portion of transit delay even at times or locations when traffic congestion is not a primary issue. For TSP to work, transit vehicles must be able to reach a signal, either with a dedicated lane or transitway, or by making use of an otherwise clear lane. Corridors with relatively long signal cycles, or relatively long distances between signals, are good candidates for active TSP. Specific intersections with long signal cycles or that favor the cross street and operate off of the progression of the rest of the corridor provide strong benefits. Where transit routes turn, active TSP can extend turn phase time or reservice a turn phase to provide a clear turn lane and additional phase time for slow maneuvers. Conditional TSP strategies are easiest to implement with moderate to long headways, allowing the signal cycle to gradually return to its non-priority timing. On higher-frequency corridors, decide whether to provide signal priority at every signal cycle, or only to late vehicles. In most applications, when a transit vehicle receives a priority phase (~10 sec), the dedicated time is restored by deducting time from up to four subsequent cycles. If headways are too short, the signal cycle can never be restored and may cause adverse delay. Harriet R Smith, P Brendon Hemily, and Miomir Ivanovic. 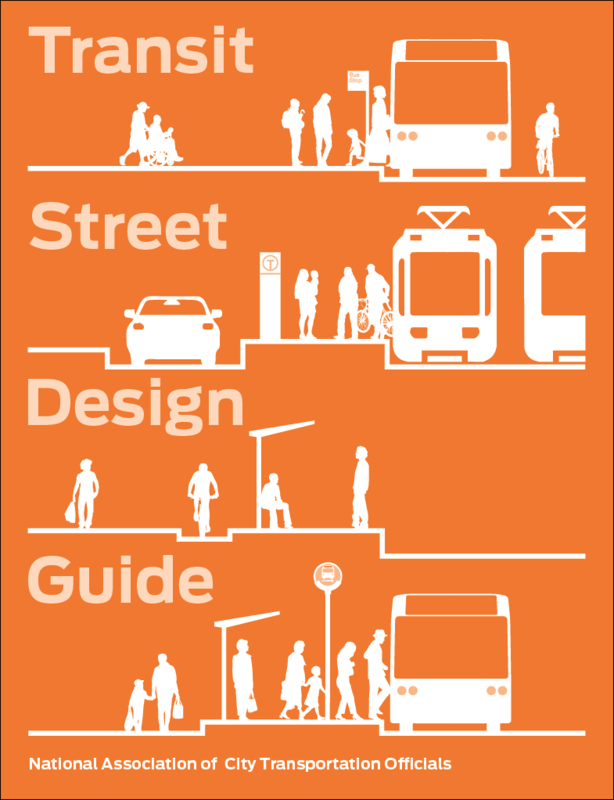 Transit signal priority (TSP): A Planning and Implementation Handbook. ITS America, Washington, DC: 2005. For BRT and LRT, which often use larger vehicles to increase headways and reduce costs on high-capacity routes. Unconditional signal priority or preemption should be considered at actuated signals. Active TSP can reduce transit delay significantly. In some cases, bus travel times have been reduced around 10%, and delay was reduced up to 50% at target intersections. TSP applications using AVL technology was demonstrated to reduce total bus trip times during peak hours between 4 and 15% in Minneapolis. Applications in Portland, Seattle, and Los Angeles noted 8–10% travel time decreases. Jia Hu, Byungkyu (Brian) Park, and A. Emily Parkany. Transit Signal Priority with Connected Vehicle Technology. Transportation Research Record 2418, Journal of the Transportation Research Board, Washington, DC: 2014. A number of studies of TSP implementation on streetcar routes in Toronto recorded widely varying travel time improvements, even up to 50% reductions in delays at some intersections. Factors such as stop siting, service frequency and ridership, and separation from traffic all impacted TSP effectiveness in reducing spot delay. Danaher, Alan R. Bus and Rail Transit Preferential Treatments in Mixed Traffic. TCRP Synthesis 83, Transportation Research Board, Washington, DC: 2010. Signal priority usefulness depends on both geometric and operational factors like transit facility type, general traffic volume and capacity, signal spacing, and cycle length. Active TSP may increase waiting times on cross streets, an especially important factor when transit lines intersect. At high transit volumes, consider pre-timed strategies such as transit signal progressions. On streets with short distances between signals, a low-speed fixed signal timing strategy may confer more benefits to transit and multi-modal traffic than active TSP. Active TSP requires a high degree of coordination between the agencies responsible for signals and transit vehicles and operations, with regard to on-board technology as well as signal technology and communications systems, transit schedules, and system goals. Coordination needs may require long-term agreements and planning of vehicle and signal equipment purchases based on goals, since not all equipment can perform all functions. Active signal priority uses a combination of on-board and wayside technology that determines what type of signal priority can be implemented. Conditional priority usually requires on-board automatic vehicle location (AVL), GPS, optical or laser communication, or other link between the transit vehicle and the signal system. Active transit signal priority can be provided on transitways using in-ground loop detectors to identify arriving transit vehicles, since only authorized vehicles are present. Intersection signal controllers and centralized traffic signal management systems are usually the longest-lifecycle elements of the system, and should be chosen with flexibility in mind and in direct coordination with transit agencies and technical specialists. In most cases, implementing active TSP will require upgrading technology in the signal controller cabinet, on board transit vehicles, or both. However, a simple detection system that detects vehicle presence only, such as an in-ground loop detector, can be used to provide unconditional priority to transit vehicles operating on a transitway without the need for special equipment, as long as the intersection already has detection capability for other vehicles. Using mobile Wi-Fi or other higher-bandwidth communication, transit vehicles can communicate their estimated time of arrival at an intersection, passenger load, schedule adherence, route number or type, and other attributes to the traffic signal controller or signal system. Various technologies can be used to detect when a transit vehicle has cleared an intersection and no longer requires priority. Advanced signal systems can use this information to prioritize signal priority requests, select the most appropriate TSP strategy for the situation, and end a priority phase as soon as it is no longer needed. Evaluate and plan TSP based on the goals of minimizing person delay and improving transit reliability. 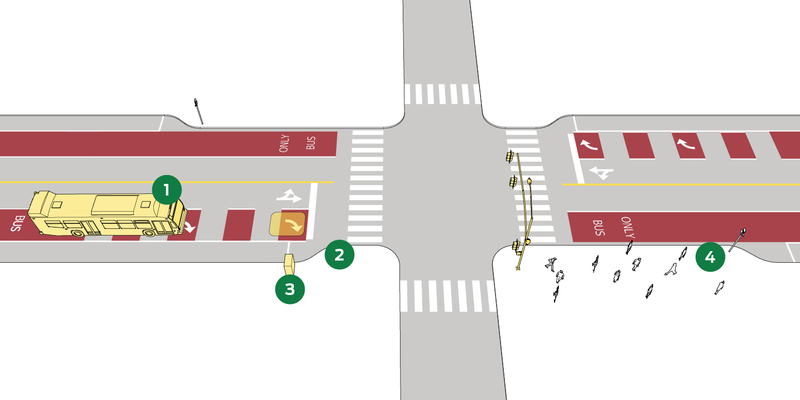 When active TSP is implemented at an intersection, priority should be provided to as many passenger arrivals as possible, based on clearance intervals and crosswalk capacity for crossing pedestrians. For transit corridors with short headways (under 6 minutes) it may be beneficial to operate conditional TSP, providing priority only to late vehicles. On corridors with longer headways or with high reliability, TSP should generally be applied to all transit runs, with time savings incorporated into the service schedule. Where headways are shorter than 4 minutes, the probability increases that transit vehicle behind another transit vehicle that receives a priority phase will be delayed as the signal cycle corrects itself. With high frequency, a fixed progression confers greater benefit to transit. Chada, Shireen, and Robert Newland. Effectiveness of Bus Signal Priority: Final Report. National Center for Transit Research, Tampa, FL: 2002. Where transit vehicle volume is high enough that not all arrivals can be provided with priority, late runs, more full vehicles, or rapid services should be prioritized. Far-side stops maximize TSP efficacy, since arrival at the signal can be anticipated more easily than dwell time. However, near-side stops may be preferable at transfer points. In mixed-traffic operations, active TSP is often more effective at off-peak periods. It is most effective at moderately high traffic volume, with volume-to-capacity (v/c) ratios of 0.5 to 0.7, and remains effective up to a v/c ratio of about 0.9. In isolation, TSP is most effective at v/c ratios between 0.5 and 0.7, which significantly benefits reducing transit delay up to 0.9. When using techniques like connected vehicle technology and green reallocation (which maintains phase length but shifts the green time based on transit arrival, instead of green extension, which simply adds green time) phases, TSP simulations showed a benefit of 85-88% delay reduction. Jia Hu, Byungkyu (Brian) Park, and A Emily Parkany. Transit Signal Priority with Connected Vehicle Technology. Transportation Research Record 2418 (2014). Signal preemption should be applied with great care, as it requires transit vehicle arrival to be anticipated far enough in advance to provide a full pedestrian clearance interval. Adaptive TSP incorporates continuous detection along transit corridors, not just at intersection approaches, and may be integrated with automatic passenger counters (APCs), communication among transit vehicles and signal controllers, and real-time traffic data to determine TSP interventions with better precision and reduce general traffic impacts. Field test of adaptive TSP showed intersection delay at one congested location was reduced for all users: 43% for buses, 16% for general traffic, and 12% for cross-street traffic. Meng Li, et al. “Modeling and implementation of adaptive transit signal priority on actuated control systems.” Computer-Aided Civil and Infrastructure Engineering, 26, no. 4 (2011). GREEN EXTENSION provides extra time for a detected transit vehicle to clear an intersection. Green extension is most applicable when transit runs at the back of the vehicle queue, as is common at the first signal after a far-side stop. Green extension may be the easiest form of TSP to implement on urban streets since it does not require unexpectedly truncating a pedestrian phase. GREEN REALLOCATION shifts when in the signal cycle the green phase occurs—if the transit vehicle is on pace to arrive late, the green phase begins and ends late to accommodate transit. Phase reallocation provides similar benefits to phase extension, but with less impact to cross street traffic since the total green time per cycle does not change. This strategy requires AVL technology. RED TRUNCATION provides a green phase earlier than otherwise programmed, clearing an intersection approach with a waiting transit vehicle sooner than otherwise. Red truncation requires the detection of the transit vehicle far enough away that the crossing pedestrian phase can clear. It is easiest to implement on long blocks or on transitways with predictable travel times. UPSTREAM GREEN TRUNCATION also known as a reverse queue jump, stops traffic behind a bus as boarding is completed, allowing the bus to re-enter the lane after a pull-out stop. Upstream green truncation can also be used to stop traffic at an intersection where transit makes a far-side in-lane stop, preventing queuing in the intersection. Green truncation is most effective on moderate frequency transit routes where delay upon reentry due to congestion is common. It can also benefit passengers alighting and crossing the street behind the bus. PHASE INSERTIONS and PHASE SEQUENCE CHANGES describe the special bus-only phases or prioritization of turn phases used for shared turn/queue jump lanes, and are also helpful when buses make left turns. PHASE RESERVICING provides the same phase twice in a given signal cycle, such as a left-turn phase or a queue jump. Reservicing a phase can significantly reduce bus delay, particularly when the phase in question is relatively short. References for Active Transit Signal Priority: 1 found. Bugg, Zachary, Jon Crisafi, Kevin Lee, Tom Urbanik, and Paul Ryus. "Effect of Transit Preferential Treatments on Vehicle Travel Time." Kittelson & Associates, Inc., Transportation Research Board, Washington.